Have I mentioned how much I love Canada? I really do love Canada -- and have for quite some time. Don and I used to vacation there. I run up now and then just to go to a friendly foreign country that is quite beautiful. Long ago I got my first border pass (called Pace) and now I have a Nexus card. It is the best deal in town. It costs $50.00 for five years and it is a free pass across the border without standing in line. It also got me through the airport in minutes when I returned from England in April because I had my eyes scanned on my Nexus before I left. Now, I can enter the country with just a peer into a machine. Today I needed a moment to myself and a little mini vacation, so I decided to run up to Vancouver for awhile. I love Granville Street which has a fantastic gourmet grocery store called Meinhardts, a country furniture store, A West Elm, William Sonoma, Anthropology and more in just two blocks. I played around there and then hopped over to Oak Street and made it to IKEA. Funny, though -- there were no great crowds. I easily parked on Granville and I'd say that IKEA had fewer shoppers than usual even at Christmas. I did have some lovely experiences, though I bought practically nothing. I got ready to feed the meter on Granville and dropped some coins that I had saved from my last trip to Canada. A lovely woman came along and helped me pick them up -- then she thought maybe I'd need something larger (like a Looney) to feed the meter -- so she whipped one out of her purse and put it in. she would not let me pay her. Once in the grocery store, I asked if they had a restroom. One of the clerks said no and followed it by, "Go a few blocks down to the Starbucks." Another clerk heard her and beckoned me over. "Go next door to the coffee shop. They won't mind." So I did. While in IKEA, I was enjoying watching family units with cute kids during my yearly feast on their delicious and caloric meatballs and potatoes and gravy. When I got up to take my tray, a gentleman took it from me and put it in the cart. I say, those Canadians are simply the best at welcoming the stranger in their midst. Maybe it was the Christmas spirit -- but I sang to the beautiful music on CBC all the way home through pouring rain. Altogether a lovely holiday shopping treat -- the best kind is where you spend little money but have lots of fun. I hope your holiday stays warm and friendly. Let's show the Canadians in our midst the same warm welcome that they showed me today. I had a few free days and decided to get a jump on Christmas. I've prepared for Christmas earlier and earlier over the years. I used to get ready about one to two weeks ahead. But, after acquiring a lifetime of ornaments and nativities, it takes longer and longer to decorate. Gone are the days of staying up half the night to put together doll houses or bikes. 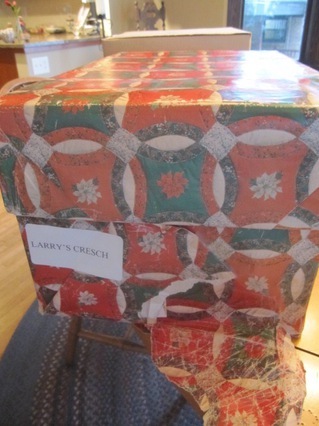 My poor clergy husband too often came home from a midnight service only to help finish projects or wrap presents. Those were the Christmases of little sleep. My mother used to tell me how the house was as usual when my grandmother hauled her and her siblings to church every Christmas Eve leaving my grandfather to put up and decorate a tree and distribute presents which, I'm sure, was a wow factor when they got home from services. What magic that must have been. There was plenty of magic in Christmas as I was growing up. Extended family with aunts and cousins meant a Christmas tree piled with presents for the gang. My dad loved Christmas and our house was full of kitschy ornaments and a ceiling full of glass balls hanging at different levels which could make one seasick after too much Christmas eggnog. It took him a week to hang those bright shiny ornaments from fishing line which virtually disappeared as they swayed as doors opened and shut and people walked through the house. So where is the magic now? 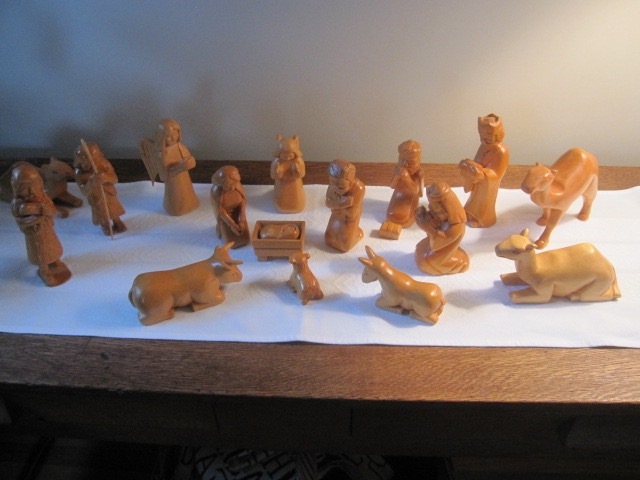 Part of it is getting into beloved ornaments and nativity sets lovingly made by good friends. I have a habit of using original boxes for my Christmas stuff so I have to giggle when getting down a ragtag box which has held the same items for over fifty years. 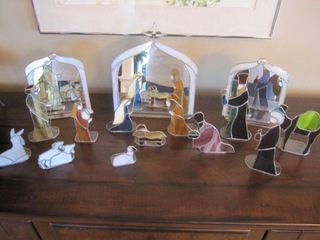 Larry made my stained glass creche which is still housed in his cleverly wrought box. The red plaid paper is tearing, but I wouldn't think of changing boxes. Keith's carved creche (which he yearly added to by sneaking pieces in when it was displayed) is housed in a plain, brown box that says "Keith's creche" in very faded letters. Almost all my items are stored in easily recognized boxes that have been around for years and years. They may be dusty and worn, but I am delighted to once again recognize the old plastic bags from Frederick and Nelsons, boxes from Hong Kong and Singapore, and several from our trips to New Mexico where many of my bought creches were purchased on trips to see Don's brother, Lloyd. There's magic in the music that fills the air and our senses. Carols just never seem to grow old. They still have all the power to conjure up good feelings. We're all hungry for peace. There is such a magic element to belief. Maybe it's a cliche for some to say that baby Jesus is once again born into a dark world bringing hope to all who believe in redemption. But it is definitely a message that we need more and more these days. And sheer belief is the ultimate magic. It touches us all in those places where hope is still alive and the wonderful moments of yesteryear are once again on our doorstep. I hope your Christmas preparations bring you joy and reminders of the magic of the season.